Bring your questions about the Blues and the NHL, and talk to Post-Dispatch hockey columnist Jeff Gordon in a live chat starting at 1 p.m. Friday. Have you taken Tavares-to-the-Blues down to zero percent yet? You had it at 5 percent last week. Have we lost all hope there? Not zero, but clearly Lou Lamoriello is doing everything to keep him. Daily conversation, which means JT has some input on the coaching hire as well as personnel moves. And there is this: The Islanders will have no choice but to give him a max contract. Losing him would be a huge blow to these owners. This Mike Hoffman thing just keeps getting weirder and weirder by the day. Considering all the confirming evidence from other players and wives you have to assume this story has at least some credibility. Let’s hope the Blues stay away from this drama. He had to know this girl was a complete psycho and now this will potentially cost him $20-30 million because teams will be so reluctant to sign him to anything other than a short-term deal. At the very least, you have to mark him way down for using poor judgment. You have to wonder if his teammates ever warned him his girlfriend was completely nuts. His next contract will probably have a clause that the team has to approve of any future girlfriends. Or, who knows, maybe he keeps this one? Yeah, if this stuff is even somewhat true teams need to be super careful. Wives drama is nothing new to the NHL, but this stuff was ugly. Although Bruce Garrioch of the Ottawa Sun believes the team can still get a good price on Hoffman, other insiders are not so sure. The team absolutely has to move him, so teams will either pass on him for off-ice concerns or try to steal Hoffman for a bargain price. Gordo, are you privy to any situations, past or present where Blues players wives or girlfriends had issues anything like this bizarre Ottawa situation? You don't need to share names, but this just seems insane and uncommon. There has been plenty of this stuff. The big one that ended up on the record was Brendan Shanahan, who ended up marrying Craig Janney's ex. There was a LOT going on back in those days, including some high jinks with Mike Keenan. Why doesn't Hoffman get rid of his girl friend? It's a bad sign he does not do that. I say keep Sobotka instead! Sobotka is a really good player plays both defense and offense he needs better players around him. This has bad vibes all over it! Yeah, Doug Armstrong hit the "team chemistry" note while discussing his off-season plans with Jim Thomas. He marveled how the Vegas team rode great chemistry all the way to the Final. What’s your take on this Mike Hoffman situation? I think he’d be a great addition to the team but I wouldn’t give up a first round draft pick for him. His value has lessened because of the Karlsson issue but it’s not like he’s Doug Gilmour or anything? He’s got a wack-a-doodle fiancé. That’s easy enough to take care of. What do you think the Blues would have to part with to get him? Now? I could see Hoffman fetching a second-round pick and middling player. The Senators were hoping to bank another No. 1 pick for him. We shall see. If he sticks with this woman and the allegations stand, this is going to be a huge issue. I saw the update today about Hutton (smartly) looking to see what's out there for him. What do you see as the Blues max offer to keep him? As well as he plays at times, I think Army views him as a backup only and will keep the offer at 2-3 years max, what say you? Sure, the Blues might go a second year with him as a back-up, but I doubt it would go three. And back-up dollars would come in under $3 million per year. Although Philipp Grubauer is the No.1 target for teams looking for a goaltender, Hutton might be the top unrestricted free agent for teams shopping for a starter. Blues management is bracing for his exit..
Last big name free agent who signed with the Blues? It appears JT is off, Kovy isn’t visiting the blues though he has visited other teams, it makes me wonder if free agency is a viable path for the blues. When the blues signed Statsny it was for the going rate and maybe a bit plus, it would seem like they would have to pay market and maybe plus for a top free agent. If so, then it’s a hard way to win in a hard cap sport. The Blues have had some tough luck in free agency. Paul Kariya, oops. Jay McKee? No. Stastny got overpaid to fill a need position and that is the norm for free agency. Adding a vanRiemsdyk would take extra dollars and extra years. That is why Armstrong would love to work the trade angle if possible. If the Blues have 3 top 4 D, Peitro, Parrayko, Edmunson, and possibly Dunn, it seems like they are set for a number of years given how D are used in the playoffs. It also appears as though they don’t have anyone ready to step in at D who could be a top four for at least a few years. If they are set, but with not depth, can they really trade a D for a forward? If the Blues believed Bouwmeester is coming back healthy enough to be a Top 4 and if they believe Reinke/Walman/Schmaltz offer legit support, then they could make a deal from the blue line. More viable, Blues trade a meaningful player or a prospect with a pick to get another forward? If they trade a prospect and this year’s number 1, which prospect and can that get a second line forward much less a center? The Blues don't have much in the way of "meaningful players" among their forwards to trade. I mentioned Sobotka as one possibility, but that is not a huge trade chip. Same for Jaskin and Barbashev. Same for Fabbri, until he plays a couple of healthy seasons. If the team puts Thompson in play, that might draw action. Other teams like Blais, but how much? There may be a team that likes Kostin, but there is a real risk of moving him before he establishes true value. As for this year's late first-round pick, that is an OK chip because teams crave cost-controlled prospects. Wouldn't it be better to trade for Hoffman and Reilly and forget Taveres. I doubt Tavares ever becomes a real option. O'Reilly bidding will be high -- and rightfully so -- and we've touched on the Hoffman dilemma. If Tavares is smart he will at least talk to other teams, which will raise the bar for the Islanders. There was a hockey rumor reported by Eklund on HOCKEY BUZZ a couple of days ago saying that the Blues and Buffalo Sabres were holding early trade conversations involving Jake Allen going to Buffalo for Robin Lehner. I know that the Blues had prior interest in acquiring Lehner a year or two ago. What have you heard about this possibility and could it be a precursor to a larger trade with Buffalo to include a center coming back to the Blues? Lehner is a restricted free agent who has been consistently substandard. He failed in Ottawa and failed in Buffalo. Allen would be a nice upgrade for Buffalo, so presumably such a maneuver would be in package sending O'Reilly here. In that scenario, the Blues would re-up Hutton as the starter and force Lehner to take a short-term deal. Unfortunately I think we’ve seen the last of Carter Hutton wearing the Blue Note. I have a strange feeling he’ll end up in Nashville. If that happens is Husso our backup or do we start playing the hot hand between Allen and Husso? There seems to be a glut of goaltending out there but nothing that rocks your socks. The Predators have no need for Hutton. The Islanders, Sabres and Hurricanes are looking for a lead goaltender and the Flames and Flyers are among the teams also looking. I don't see Husso getting the back-up job with no real NHL experience. The Blues would shop the back-up market for his replacement, assuming that Allen stays put. At the right price of course, would you like to see Ryan Reeves come back? Also, what is the status of Thorburn? Thorburn has another contract year, but it's at a low cost. He could be on the waiver wire or relegated to playing once every few weeks. Reaves would be a nice add IF the Blues filled other needs. I think it is highly likely that some team is going to pay Carter Hutton big money to play 65-70 games. That leaves Jake Allen to play how many games and who will be the back up? The back-up market is full of options, either in free agency or a minor trade. ....and as a follow up, maybe he's afraid to catch her wrath if he were to dump her. I don't know her and I'm scared of her. 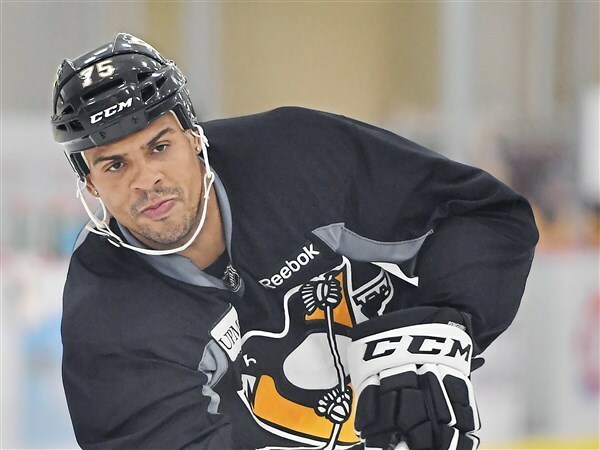 I thought that I heard a report earlier this season that former Blue, Ryan Reaves, refused to stand for the United States' National Anthem while playing with the Pittsburgh Penguins. Reportedly he received some threats as a result of his decision not to stand for the Star Spangled Banner and reversed his decision not to stand and issued an apology for his decision. Is this story correct? And, if so, would St. Louis fans be tolerant of a Ryan Reaves return to the Blues given his involvement? I don't recall Ryan's reaction during all that. He did say that he wasn't interested in a White House visit. As for a fan boycott, I suppose a few fans might quit coming to Blues games if Reaves came here and engaged in any form of social protest. T - minus 1 week now to the NHL Amateur Draft next Friday in Dallas. What are your odds on Doug Armstrong "pulling-the-trigger" on a trade or two leading up to or during the draft? I'd say 80 percent. He is a motivated shopper. His challenge will be striking deals while facing heavy competition. Assuming he stays healthy until then, do you see Fabbri getting top six duty? You can't bank on him, but there is little doubt that if he stays healthy, he really puts the Blues in Cup contention, as he will be cheap and they have to add talent as if he won't be a big factor. This all could be a crazy blessing for the Blues. If he gets healthy, stays healthy and plays to his ability, Fabbri could work into the Top 6. That is what the club has always envisioned for him. Are "improvements" being made again this summer at Enterprise Center? If so, what are they and how are they progressing? No idea. I do not follow the arena improvement story. I believe that in the last week, Blues' GM Doug Armstrong has said that Robbi Fabbri is progressing well at home this summer and Vladi Tarasenko has been rehabbing well, here in St. Louis this summer. What have tou heard, if anything, about the progression of Carl Gunnarson, Jay Bouwmeester and Jayden Schwartz with their injuries? Schwartz's injury was supposedly minor and of no concern for camp. Armstrong has been confident about the two veteran D-men, but we're still months away from camp. Any word yet on a new Blues' coaching addition to run the power play? If not, why not?